I came across your website while doing a search on information for Wheddon Cross. My father, who is now 82 years old, was a German prisoner of war, and for a time worked at a farm called Higher House Farm just outside of Wheddon Cross. The farm was owned by the family of Wilfred and Violet Stevens. We were wondering if the farm is still in existence? 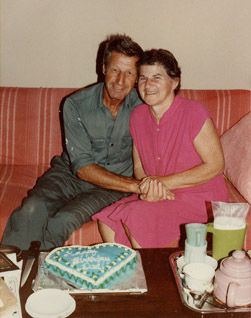 I am attaching a couple of pictures, one of the farm in the valley, facing north, Dunkery Beacon would be up on the hill in the distance, and a picture of my parents, Hans and Maria Behrmann, standing beside the Beacon. Both pictures were taken in 1949. 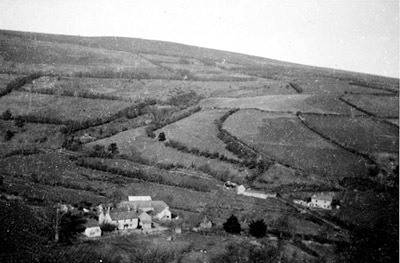 In the summer of 1948 I lived in a prisoner of war camp in Dulverton in the county of Devon. The commandant, a retired British Colonel asked around in camp who would like to work on a farm in the Exmoor Hills. I knew a little about farming and so I stepped forward and volunteered. The Colonel was very pleased, and took me in his little Austin car up to Higher House. The Stevens family took me in and placed me in the bedroom above the kitchen. It took me a while to get used to a two-century old house, but it didn't take me long to become aware to live with one of the nicest, peaceful family I ever met in my life. Mr. Stevens was a calm and quiet man. Mrs. Stevens was simply an angel of friendliness and politeness. The way she handled Jimmy, the guy you married, who was then about 5 years old, in a very nice way to go to bed when sometimes he was reluctant to go. It was years of peaceful living I ever experienced in my life. Bedtime was 9:15 p.m. after listening to the BBC news. 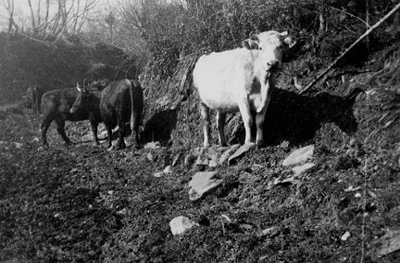 Higher House Farm in the 1940s and some of the cattle in the hills at the back of the farm. I was the first one up in the morning, got a bundle of firewood in, lit the fire and hung the black water kettle over it and it was boiling when Mrs. Stevens came down and made tea. Saturday afternoon I was off to Wheddon Cross to catch the bus to Minehead to go shopping. I was buying some clothes in Floyd's Department store when an Irish lady who heard my accent asked me if I could da favour for her. She made friends with several German POW's and could I translate some letters for her that she received from Germany. She invited me for tea and scones. I had to visit her on weekends, and one evening she handed me a slip of paper cut our from the local paper. I stuck it in my pocket and boarded the bus home. Sunday morning after doing my chores in the cowhouse I went back to to my room and pulled out the piece of paper. It said: Austrian girl, anxious to meet another one for companionship in her off duty time. Write Box 26 West Somerset Free Press. What's that got to do with me, I asked the Irish lady. Why not, she you may get a girlfriend. So I wrote a letter to Box 265, explaining that I am not a girl but a guy. Back came the answer: it wasn't me but the Lady I work for put the ad in Paper without my knowledge, and mine was the only answer she received from the ad. The girl wasn't interested, but the Lady said "proper English etiquette reires that you at least answer the letter." So we agreed to meet the next Saturday at 1:00 .m. on the Avenue in Minehead. I got off the bus and looked up and down the street, when I spotted a girl in a green Lodencoat. I crossed the street and walked towards her while looking in a store window. Are you the Austrian girl I asked her. She spun around and seeing me, her eyes grew wide and she said yes. And typical English weather, that moment the rain came down. I said to her there is a Woolworth store across the street where we could talk. Getting acquainted I told her that an Irish lady invited both of us for tea and scones. So we went to the lady and spent a pleasant afternoon there. Then the girl, Maria was her name, said she had to go back to work, and if I said if she wanted to see me again, that's fine, and if she didn't want to see me again that's fine also. Yes, she wanted to see me again. 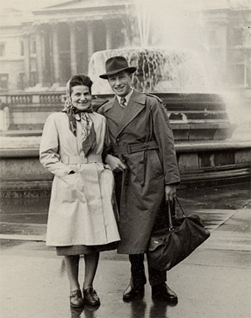 We courted for 2 years and on August 5, 1950, we got married in the little town of Williton and on April 20, 1951 we boarded the M.S. Georgic in Southampton for Halifax in Canada. 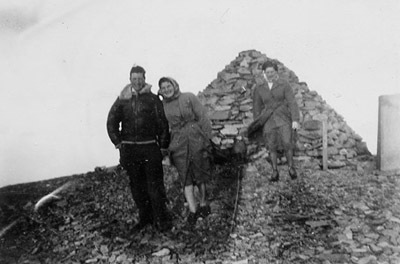 With me in that photo at Dunkery Beacon are my wife, Maria, and another German girl whose name and where she lived I have forgotten. There were more German POW's in the neighbourhood. Next door at Hawkington was Reinhold Kasiankowski, a nice fellow from the former province of Silesia, and at the Melhuish Farm in Wheddon Cross was Helmut Schmidt, another young fellow from Berlin. Yes, I have heard of the Foot and Mouth in England, but why were the cattle all destroyed? There was Foot and Mouth in Germany shortly before the war. They were treated for 6 weeks when the disease waned. All entrances to farms and dairies had a deep layer of peat moss on the ground saturated with some chemicals where everyone entering the building had to step in with their shoes to prevent the disease from spreading. Six weeks later the disease was gone. 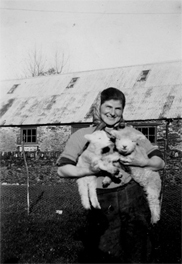 Attached you will find a picture of Maria with two orphan lambs. And you know what happens to them: they get spoiled rotten, always in between your feet. I remember one incident. We were sitting at the table having lunch. I was talking to Mr. Stevens, and when he put his cup down I noticed it was filled with water. I asked how come? Mrs. Stevens replied she was running out of tea. Remember there was food rationing for many years after the war. I was so embarrassed, since I had tea. "Mrs. Stevens," I cried out, "From now on, no more tea for me, my tea ration is for you and the boss only. We drink coffee in Germany and I'll have coffee from now on." Coffee was not rationed and was only five shillings per pound, and it mattered not to me if I had tea or coffee. Just before Maria and I got married I reluctantly had to hand in my notice to the boss because we had to have accommodation which I found at Lower Foxcombe in Exford. A lady had a farm where she had horse riding and also a cottage that was vacant. Before I came to Higher House, old Grandpa Stevens lived in the cottage. There was also a young married couple living in the cottage. At that time England had a desperate shortage of housing and many young couples were forced to live with their parents. Mr. Stevens said he would find the couple somewhere else to live so I could move in. That I could not agree with my conscience, that an English couple would have to move so that a former enemy soldier could move in. But I kept in touch with the Stevens family and offered them my tea ration. He came over with his car and picked it up, bringing me a bag of apples from his garden in return, which Maria and I relished. I was bitter at first when the Americans brought us to England, but when I lived at Higher House farm I came to like your country. The landscape was pretty, especially the highway up towards Wheddon Cross and down towards Timberscombe which was lined with azaleas which looked so pretty. Next week I will be 83. Coming to Canada was an experience, but we were young and eager to get established and worked hard for it. One of my greatest regrets is that I forgot Higher House Farm for a time and the good people there. I should have mailed a few pounds of good tea to Higher House, it's nagging at my conscience.